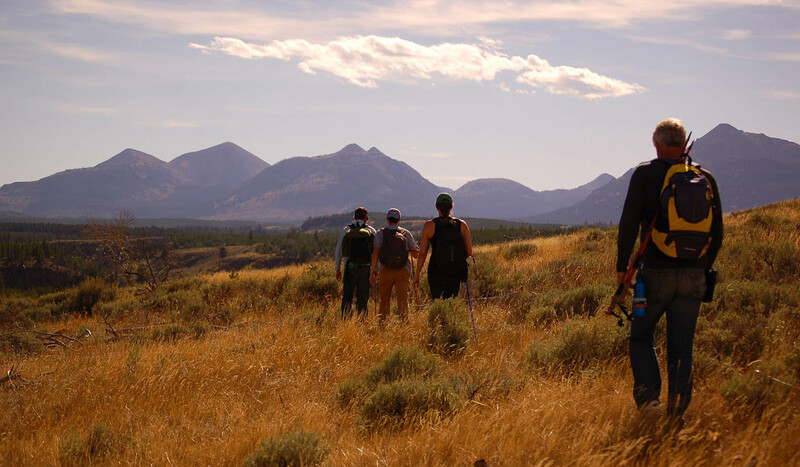 Our expert team leads hiking adventures to the best of Yellowstone. Our most popular hike, the Lamar Valley Safari Hike, gets you off the beaten path in the 'Serengeti of North America.' Watch wolves through our spotting scopes while eating a gourmet lunch. Trek to Lone Star geyser through the 1988 burn and an old growth forest. Watch Lone Star erupt for nearly 30 minutes while eating lunch. Then explore the Firehole River, with so many thermal features to see! Want to climb a peak? Our guides will take you to the top of Bunsen Peak just south of Mammoth Hot Springs for vistas of the stunning Rocky Mountains in all directions. Lunch served on the peak or down by Osprey Falls if the group is feeling strong. From large mammals to small birds, cliffs to meadows, front country to backcountry, let us show you all that Yellowstone has to offer. We can arrange multi-day itineraries for singles and groups, as well as multi-sport. Our tours depart Gardiner everyday year-round at 7am. We have a variety of meeting locations within Yellowstone to streamline your day. Call for more information(406) 848-1144 or e-mail mahan@yellowstonehikingguides.com.